The arms featured on the flag of Austria can be traced back to Duke Frederick the 2nd (13th century), and are a good example of so-called "arms of dominion." They were used almost entirely in heraldic form until the 18th century when the red-white-red colored stripes were used as the basis for the new naval ensign, with a further crowned shield over all. In the year 1867 they were combined with the red-white-green of Hungary to make the joint civil ensign. 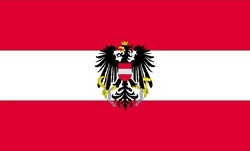 With the dissolution of that empire in the early years of the 20th century, the Austrian colors alone were retained. The black eagle of the Holy Roman Empire was in retained in simplified form, with the hammer and the sickle replacing the orb and the scepter. When the republic was restored in 1945 the flag and arms were revived, with broken shackles attached to the eagle's legs. This national flag can be purchased HERE.